The St. Johns River provided much of Ossachite’s food. The broad waterway, moreover, served as the chief route for canoes. These were the Timucua’s principle means of transportation, besides walking. An Indian trail also ran north and south through Ossachite. Since the Timucua didn’t have horses, they would’ve trod along this path. It intersected the St. Johns at the river crossing later called “Cowford” (Jacksonville). The crossing was in the vicinity of the former Duval County Courthouse downtown. During the 1760s, the British blazed the Kings Road over the Indian trail. It ran from the Daytona Beach area into southeast Georgia. Today, portions of US 1 follow this old route. Another Indian path once stretched from present-day downtown Jacksonville to the Florida Panhandle. State Road 90 follows parts of this trail. Consider the reasons why the Timucua liked Ossachite’s location: It was protected from ocean storms, was well drained from rain water, and was served by an important waterway, as well as by convenient trails. History repeats itself. During the 1820s, the founders of Jacksonville took these same considerations to heart. 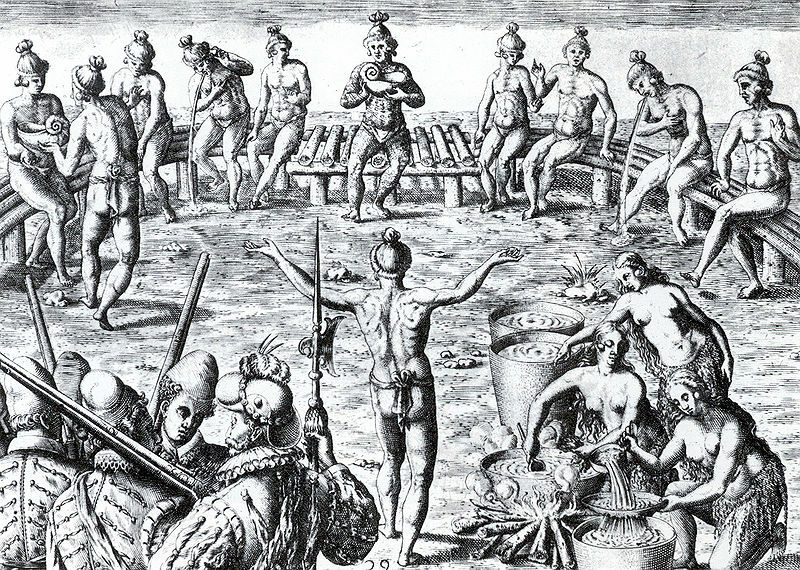 The tribesmen gather for Black Drink. Ossachite featured a large council house. Each morning, the chief would meet there with his male counselors. They received their salutes from the other residents, and they discussed community business. Like many modern people with their morning coffee, the native men sipped a brew that contained caffeine. 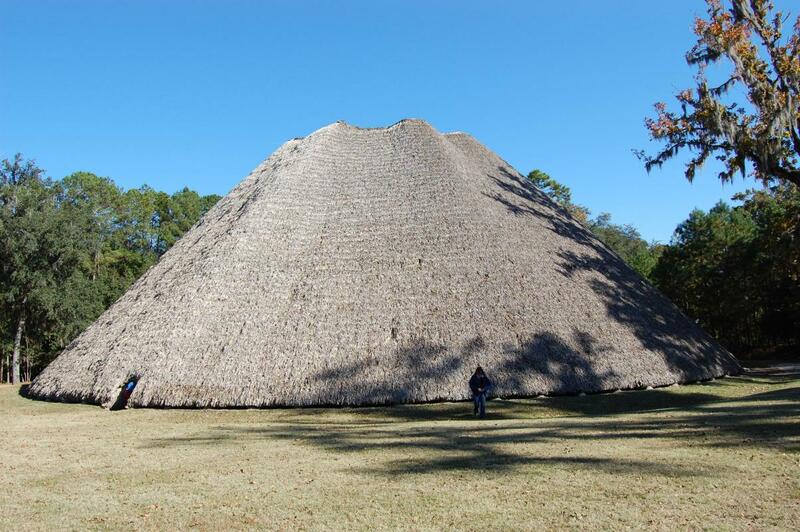 By the way, Timucua chiefs sometimes met with female advisors. And the Timucua chiefs were occasionally women. MORE ABOUT OSSACHITE — The Timucua’s grand city was bordered by two clear streams. These rivulets are certainly not clear today, and they’re now known as Hogans Creek and McCoy’s Creek. Hogan’s Creek splits downtown Jax from Springfield and the Eastside, while McCoy’s Creek flows west to east at the southern edge of LaVilla, next to the Prime Osborn Convention Center. Hundreds of years ago, high-ranking Timucua built their homes along the south bank of Hogans Creek and the north bank of McCoy’s Creek. Ossachite must have been as busy as a beehive. Living in the city were many craftsmen. These included potters, painters, wood carvers, shell workers, and copper artisans. They traded with other Indians who lived as far away as the Great Lakes. A reconstruction of an Indian council house, located at Mission San Luis in Tallahassee. Ossachite also contained numerous storehouses, as well as dwellings for religious workers and a large burial mound. Topped with buildings, the mound was accessed by an earthen ramp 200 yards long. The city’s most prominent structure was the council house, used for community meetings. So large that it was constructed with whole tree trunks, the oval-shaped structure could seat hundreds.